Sales forecast is one of core features of Inventory Planner and is used as input for replenishment suggestions. The default forecasting method in Inventory Planner is based on historical sales for each product. We use the sales velocity that excludes periods of time when product was out of stock and also analyze recents sales trends. Inventory Planner automatically collects when a product is out of stock starting from the moment you connect your store to Inventory Planner. This data helps to estimate the demand correctly. For example, if you sell on average ten units of product A per month and the product is out of stock half a month the real demand for it is 20 units. Without taking stockouts into account, the forecasted demand could be too low. 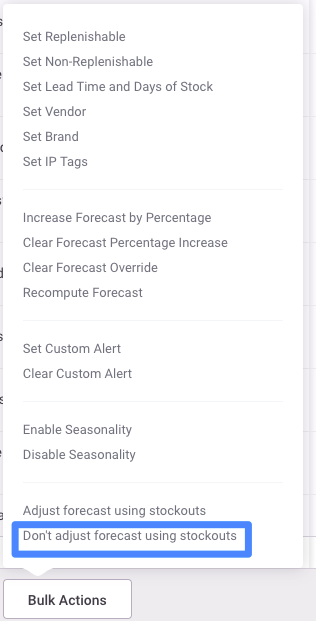 If you would like to change this setting for only a set of products (not your entire account), in Replenishment, select items > Bulk Actions > "Don't adjust forecast using stockouts". This setting can also be changed via variant details > Edit Forecast. Top-down forecasting should be used for seasonal products that do not have 12 months of sales history. When it is enabled, Inventory Planner computes sales forecast for the product category and breaks it down into products, taking into account each product contribution into the category. For example, if Product A contributes 2% of revenue to Category Z, then the forecast will continue to show a 2% contribution of Product A to the category following seasonal trends of the category. You can enable top-down forecasting in Account > Settings. Note: If you need to make additional changes to your forecast, read our article about the Edit Forecast functionality.